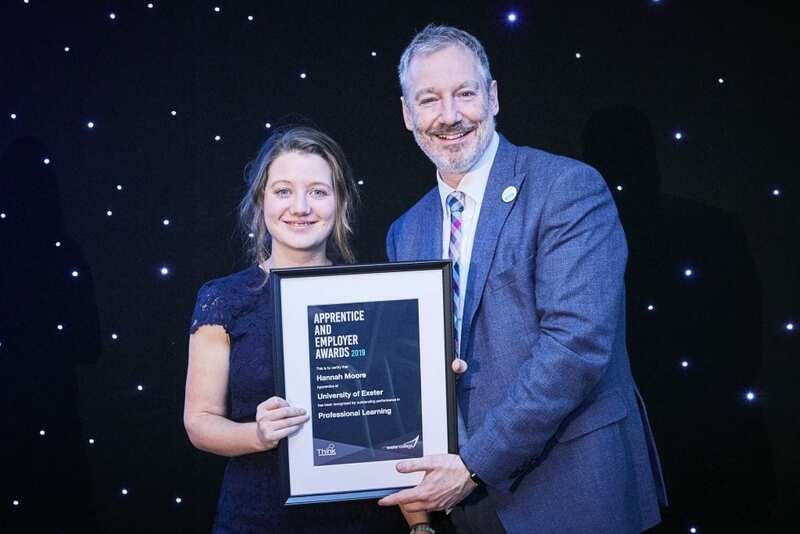 Exeter College has held its annual awards celebrating exceptional apprentices and honouring the employers that go above and beyond to encourage these individuals. More than 180 apprentices, employers, key business leaders, friends and family attended the glittering awards ceremony held at Sandy Park. The evening saw the celebration of the achievements of fifteen apprentice winners, four employer winners and three special recognition awards. The event, kindly sponsored by tax, accountancy and financial services experts Simpkins Edwards, aerospace engineering firm MB Aerospace, and law firm Foot Anstey took place on Friday 8th February. Martine Tucker Vincent (shown in feature photo), Early Years Educator Apprentice at Pine Cones Nursery in Sidmouth, was awarded the overall ‘Apprentice of the Year.’ Martine started her journey on a Traineeship, quickly showing her ability and determination, moving onto an Early Years Educator Level 2 Apprenticeship and now Level 3. 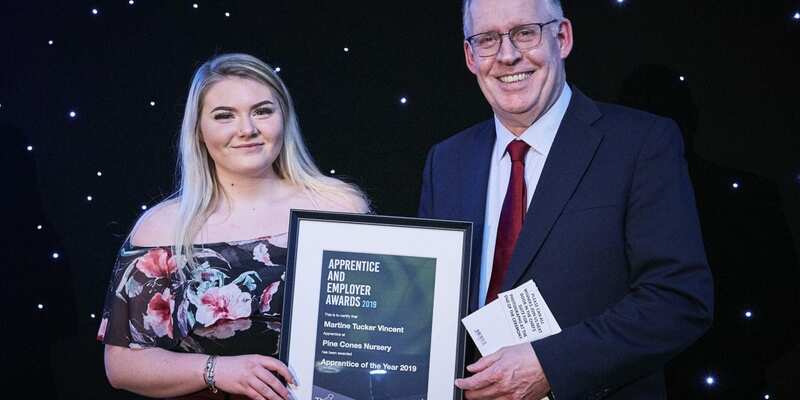 The apprenticeship team shortlisted five apprentices to be considered for the Award and it was the unenviable task of the Award’s five judges to select their overall winner. The judging group was made up of Brian Lodge from South West Comms, Adam Owen-Jones from Pennon Group, Richard Golsworthy from Mercedes Benz, Kate Merrick from MB Aerospace and Robyn Agar from IKEA. 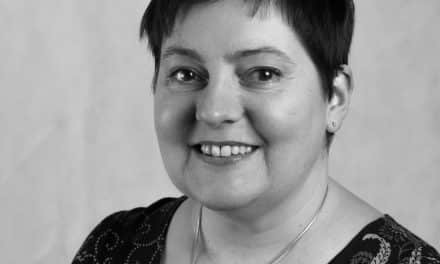 Her employer says that she is an absolute pleasure to teach and if Martine is an example of the future of our Early Years sector, it’s looking bright. The employer winners named at the awards were Cormac, Devon Bricklaying, Coombe Pafford School and University of Exeter. 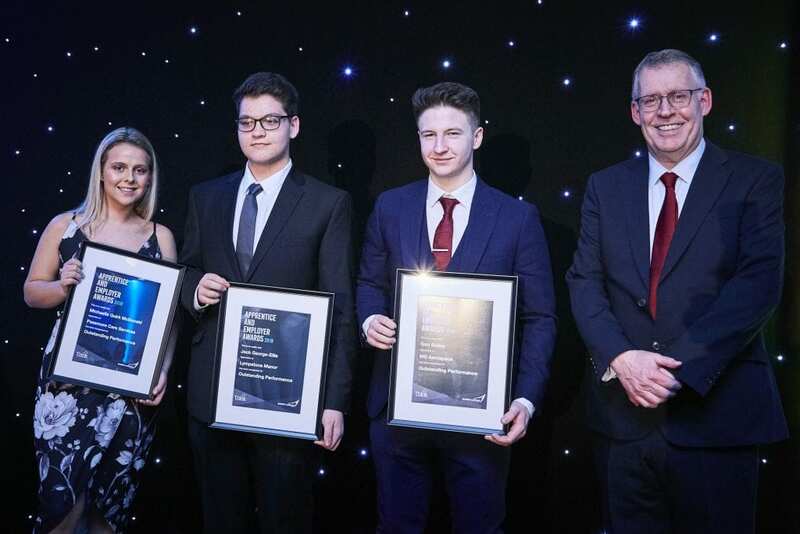 Meanwhile, the special contribution award winners were civil engineering consultancy, AWP, and the Royal Devon and Exeter Foundation Trust, for Outstanding Contribution to Apprenticeships, and Andrew Perry from Great Western Railway for Exeter College Apprenticeship Lifetime Achievement Award. 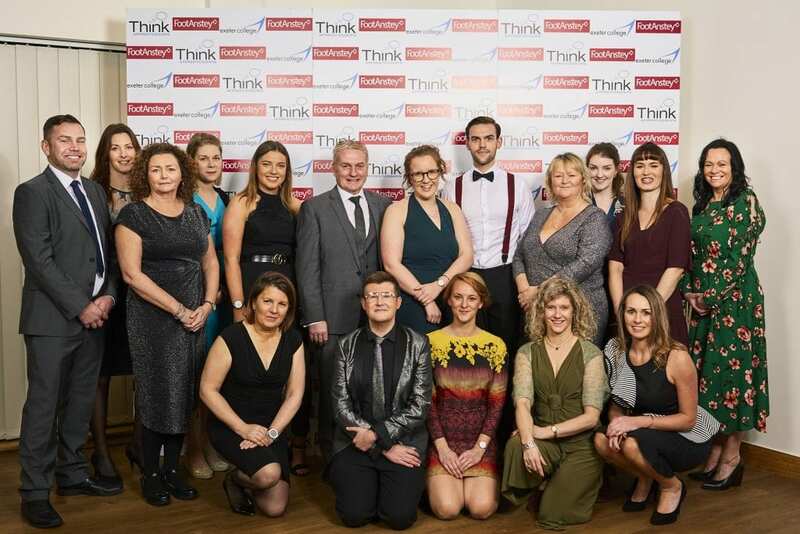 As well as nominated apprentices and employers, other key businesses and partners attended including Taylor Wimpey, Devon County Council, Radio Exe and St Austell Brewery. 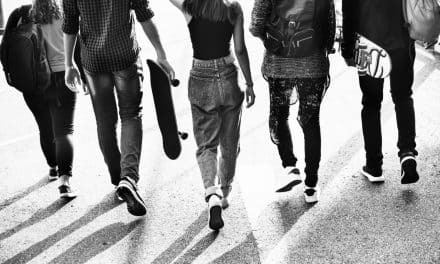 Exeter College has a substantial network of more than 950 employers that support Apprenticeships and this number is growing. 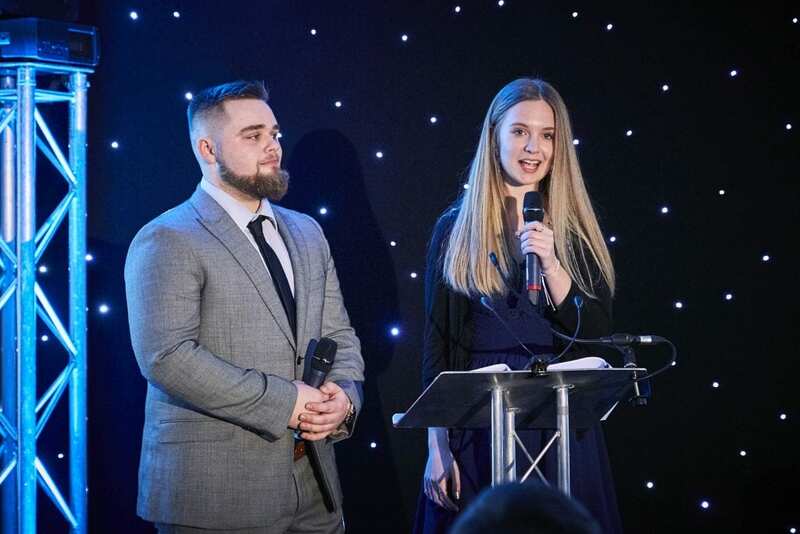 The evening was compered by Exeter College’s own apprentices Ben Snow and Honor Lovell, who both work at University of Exeter. 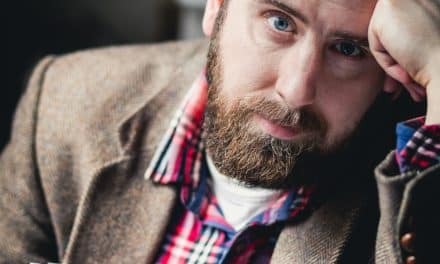 “We are lucky to enjoy such a rich and diverse local business community and Apprenticeships play an important role in giving individuals the opportunity to reach their potential and nurture local talent, helping our economy to continue to grow.” Jake, is a strong advocate of Apprenticeships and champions the initiative through his work developing skills in over 100 countries. Apprenticeships at the College have continued to go from strength-to-strength, heralding another year of growth, with 1,000 plus starts. The college is positioned in the top spot in the South of England for exceptional employer satisfaction, and second out of circa 200 FE colleges nationally. It scored 99% – very close to a near perfect 100%, well above the national figure of 85.2%, according to figures released by the Department for Education (DfE) in its 2018 survey of employers.